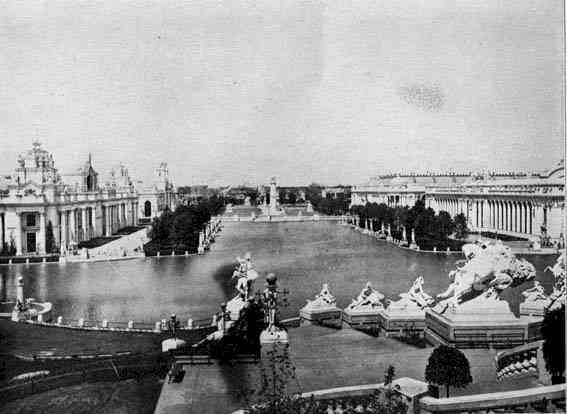 It has been remarked that at previous expositions there were but two or three good views, while the Louisiana Purchase Exposition has hundreds. Of these the prospect from Festival Hall over the Grand Basin ranks easily among the first. Here one has the glorious stretch of water, with its surface gently rippled by passing gondolas and launches, and all the way down the lagoon and along the Plaza of St. Louis are rows of transplanted maple trees, affording shade and the color of verdure. To the right lies the stately Palace of Education, with the Manufactures Palace beyond it. To the left, crowned by figures holding aloft golden stars, is Electricity Palace, and further along the Palace of Varied Industries. Fronting the Grand Basin is the tall Louisiana Purchase Monument, torched with gold. On beyond is the broad Plaza, with level space for multitudes. At right and left are band-stands and statuary, an in the center line is the heroic figure of King Louis IX of France, the great Crusader and patron saint of the City of St. Louis. In the far distance are the Tyrolean Alps, a fitting background. At sunset is perhaps the best time to see this view, when the dying lights soften and mellow every object. Then the view is enchanting. A little later, when the myriad lights show forth, and the cascades play, it is entrancing.